There are many types of memory. A child may be strong in storing one type of memory but not the other. Having an understanding of the types of memory is useful for parents to understand your child’s learning behaviour. We know that when we store a memory, we are storing information. What that information is and how long we retain it determines what type of memory it is. There are 2 major types of memory – long-term memory and short-term memory, based on how long the memory is stored. Within long-term memory, there are 2 major subtypes, namely, explicit and implicit memory. Explicit memory requires conscious thought, such as recalling who came to your birthday party last month or naming all tropical fruits. Recalling who attended your birthday party last month is further categorized as episodic memory as it involves recall of a particular event, experience or episode. Remembering the names of all tropical fruits falls into the category of semantic memory or “knowledge” memory and is the key memory that is tested in schools. Implicit memory, on the other hand, does not require conscious thought. It allows you to do things by rote, such as tying your shoe laces or riding a bicycle. Short-term memory and working memory are both memory systems that hold information for only a short duration of time. Short-term memory describes the very short time that you keep something in mind before either dismissing it or transferring it to long-term memory, like remembering a phone number long enough to write it down. Also called the brain’s “mental workplace”, working memory involves not only storage of information but also active manipulation of the information. An example of working memory is when you need to recall a phone number and recite it backwards. 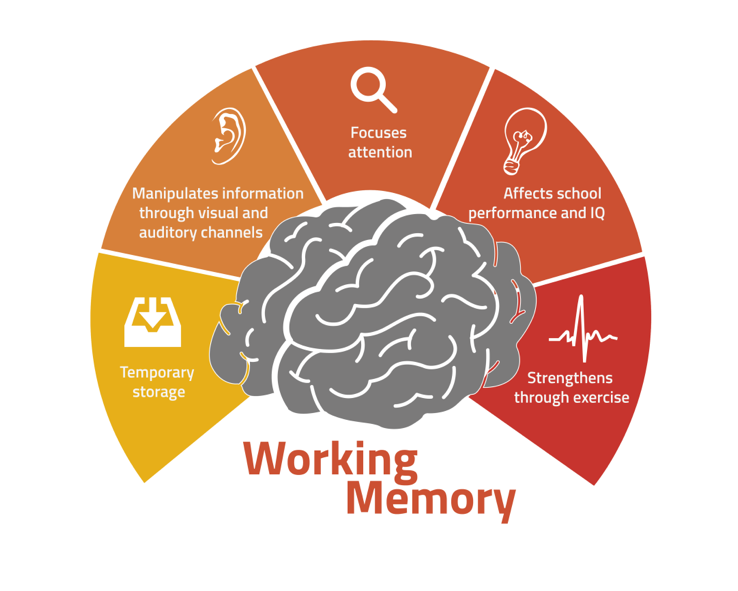 Working memory has attracted significant research interest in recent years, as scientists come to understand its great importance in learning and performance. Increasing working memory has been found to improve problem solving ability (especially in passage comprehension and Math problem questions), school results and even general intelligence (IQ). We now understand that working memory consists of 3 parts – a phonological loop which processes auditory or language information, a visual scratch pad which processes visual information and a central executive that works on maintaining focus. Having such an understanding allows us to know how to strengthen working memory through appropriate exercises. All memories are different – Understand that a child may not be uniformly strong or weak in all memory types. Some parents complain that their child is able to remember an event with all its excruciating details but fail to remember the spelling list learnt the night before! When parents understand that these 2 types of memories are different and located in different regions of the brain, they will realize that their child is not being “lazy” when it comes to remembering school-related information, but that one area of the brain may simply be “fitter” than the other! Spelling – Remembering the spelling of words is a type of semantic or “knowledge” memory. Spelling in particular requires students to be strong in their phonological memory, or the recall of the sounds of letters. During the preschool years, besides teaching the names of the alphabets, having children develop a high sensitivity to the sounds of letters and words is useful in building phonological memory and nurturing the foundation of spelling. Sleep – We all know how a good night’s sleep is able to help us feel refreshed and put us in a better mood, but do you know that sleep also helps us with memory consolidation? Many people think that the brain is passive and resting when we sleep, which is not the case at all. Our brains are actively “filing and organizing” when we sleep – junking unimportant information and storing important ones. Ensuring that your child gets a good night’s sleep each night is highly beneficial to help with learning and memory formations. Train Working Memory – Working memory or “thinking” memory is the key engine that is actively at work when we are solving a problem. Working memory helps us to pay attention to the problem at hand and at the same time search within our long-term knowledge storage of facts and formulae to help solve the challenge. Working memory can be actively trained through exercises. One example of a working memory exercise is to recall a string of numbers or letters backwards (without writing them down!). 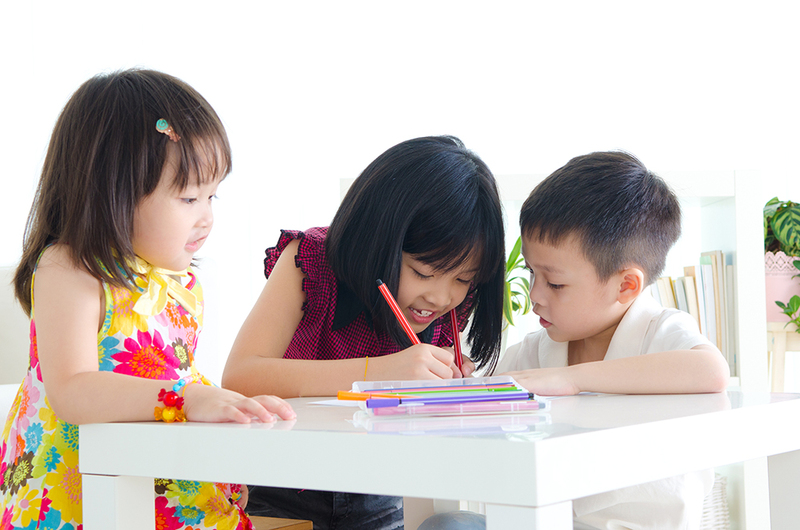 You can also get help from BrainFit if your child requires working memory training. Learn Memory Strategies – Memory techniques can be very useful in helping to make information more memorable so that storage and recall can be more successful. We will discuss memory techniques and strategies further in our next article.